Mobile first internet marketing strategies are the optimal ways to encourage art browses and art purchases by Millennials, according to a survey of 4,534 adults in the United States during March 2016. The findings become accessible worldwide with the release of the American Attitudes Toward Art survey commissioned by Invaluable, online marketplace for antiques, collectibles and fine arts. They consider marketing and sales implications of rising U.S. consumer spending on arts and culture-related goods, from $119.11 billion in 1999 to $151.71 billion in 2013. They determine that the 65.3 percent of U.S. consumers purchasing art include 24.1 percent of 18- to 24-year-old Millennials and 48.6 percent of 65-plus-year-old Baby Boomers. Invaluable ‏@InvaluableLive's tweet April 14, 2016, at 10:51 a.m.: "Has the way we experience art changed? New study reveals new behaviors of art enthusiasts: http://huff.to/1S9X0to"
The 2015 U.S. Mobile App Report, released September 22nd, finds two-year digital media time increases by almost 50 percent and supports mobile first internet marketing strategies. The report gives mobile apps direct responsibility for 54 percent of all digital media time and for more than 75 percent of total digital media growth. It has 18- to 34-year-old Millennials spending 15 percent of total mobile app time per month on information and news-gathering and 29 percent on social networking. Facebook is first in attracting social media app-related time, at 25.7 hours monthly, well in advance of Instagram’s 7.0, Snapchat’s 5.9, Tumblr’s 5.7 and Twitter’s 3.5. Pinterest joins Instagram as social media channels that 33.8 percent of 25- to 34-year-old, and 44.3 percent of 18- to 24-year-old, Millennials use for browsing art. Follow Invaluable ‏@InvaluableLive's tweet April 16, 2016, at 9:05 a.m.: "How do you discover art? New data reveals major shift in engagement behavior (via @Adweek) http://ow.ly/4mKwSi"
Art keeps the United States of America afloat since $64 billion in exported arts goods in 2010 and $75 billion in 2012 help reduce trade deficits. The 2014 National Art Index statistics of two-year increases by 17 percent in exported jewelry, movies and paintings lead survey respondents to consider investing in art. They make 37.2 percent of 25- to 34-year-old, and 41.9 percent of 18- to 24-year-old, Millennials value art purchases as worthwhile investments in the long term. Twenty percent of Invaluable-commissioned survey respondents need to tour museums to consider and expand art-related investments while 15.9 percent visit galleries and 22.7 percent social media. Mobile first internet marketing strategies offer tourism-related implications since 14 percent of respondents visit galleries and museums once a month and 38.6 percent once a year. SVA Continuing Ed ‏@SVAContinuingEd's tweet April 14, 2016, at 9:10 a.m.: "Study Finds Millennials Prefer Instagram to Museums http://ow.ly/10FdHy via @artnet #contemporaryart"
Invaluable-commissioned survey findings predict that the daily operations of art galleries and of museums throughout the United States will rely upon mobile first internet marketing strategies. Accenture global professional services company thinks that annual $600 billion spending by 80 million U.S.-based Millennials browsing and shopping online will reach $1.4 trillion by 2020. Invaluable @InvaluableLive's tweet April 20, 2016, at 2:05 p.m.: "How Millennials Are Transforming the Online Art Marketplace (via @artinfodotcom): http://ow.ly/4mUgKU "
The Art Newspaper ‏@TheArtNewspaper's tweet april 19, 2016, at 11:48 a.m.: "Online art market defies global slowdown with 24% growth last year http://ow.ly/4mRYMR"
Beck, Martin. 24 September 2015. “Mobile Millennials Spend Almost an Hour a Day on Facebook [comScore].” Marketing Land > Social Media Marketing. “Consumer Expenditure on Arts and Culture-Related Goods in the United States from 1999 to 2013 (in Billion U.S. Dollars).” Statista > Industries > Sports & Recreation > Arts & Culture. Donnelly, Christopher; and Scaff, Renato. “Who Are the Millennial Shoppers? And What Do They Really Want?” Accenture > Outlook. Invaluable. 12 April 2016. “American Attitudes Toward Art – Invaluable 2016.” LinkedIn Corporation > SlideShare > Art & Photos. Lella, Adam; Lipsman, Andrew, and Martin, Ben. 22 September 2015. “The 2015 U.S. Mobile App Report.” comScore > Insights > Presentations & Whitepapers. Luttrell, Regina, and Karen McGrath. 14 April 2016. 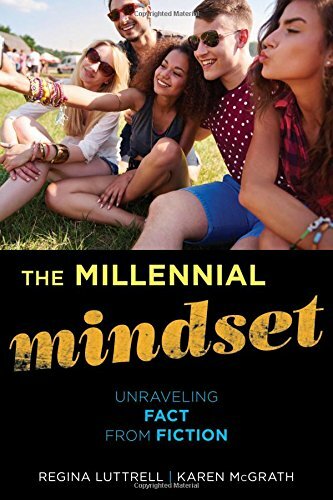 The Millennial Mindset: Unraveling Fact From Fiction. Lanham MD: Rowman & Littlefield. Mohan, Isvari. 19 April 2016. “The Art of Marketing to Millennials.” Boston Globe > Business & Tech. Sterling, Greg. 23 September 2015. “Apps Eat Digital Media Time, with Top 3 Capturing 80 Percent.” Marketing Land > Mobile Marketing. “Study: U.S. Millennials Prefer Instagram to Museums; Purchase & Discover Art Online.” Business Wire > News. ICOM ‏@IcomOfficiel's tweet april 17, 2016, at 6:18 a.m.: "#WeekendReads Instagram Trumps Museums Among Millennials Via @artnet"
Selfie in front of artist Camilo Matiz's "Take A Selfie/Fake A Life" neon, framed mirror art piece displayed at SCOPE Miami Beach 2015 on Dec. 4, 2015 in Miami, Florida: Photo by JP Yim/Getty Images. sandyspider, Revisits are always welcome! katiem2, It puts them at the front of the line, which is good because with everything that the Millennials have going for them and with everything that they're facing, in terms of land, sea and space, it's a really competitive world. Yes, I have two millennial daughters, they learn a lot from me and my driven ethics stating they will be ahead of their peers by adopting the habits and knowledge we have to offer, now that makes for an interesting millennial. katiem2, Thank you for sharing Holly's story! Internet marketing and presences really make a difference: it's one of the benefits of being -- or living among -- Millennials. A writer friend of mine, met her at hubpages sells her art on facebook, she has sold paintings in I think just about every state in the united states except two or so. Her name is Holly and she is amazing. I love her as both an artist and a human being, she is a wonderful human being. I am so impressed with how she has grown her art market, she will be famous with her work scattered across the globe. sandyspider, Thank you! It's impressive how the opposite ends of the age spectrum, Millennials and Baby Boomers, particularly put apps and mobile devices to very good use, according to the survey upon which the article is based. Apps and mobile devices are a daily thing. Good to read about the strategies. blackspanielgallery, Apps are everywhere. Technological advance is a convenience, but the business of the technological age and the growing pervasiveness of its reach can mean a sleepless two to seven days every six months when the next set of app (and other cyber) changes go through. Interesting. I have to get to an understanding of apps.